Ahhh, Christmas and New Year. I do so love you but I am left feeling utterly decadent and overindulged. Over the last few weeks I have had my fill of armagnac, scallops, venison, oysters, fillet steak and dare I mention it…foie gras. I know I am lucky and now I am quite rightly feeling a little ashamed of myself. As is normal with me, I now long to save money and eat healthily, give up alcohol and become a saint. All of which are utterly unachievable. But for the next 7 days at least, I can fool myself…. So this little dish that I knocked up made me feel righteous even if just for the night. Firstly, it is meat free. I cannot call it vegetarian as it is bathed in duck fat and chicken stock (much like kidding yourself that having just one glass of wine is abstaining). But it did feel good to skip meat none the less. 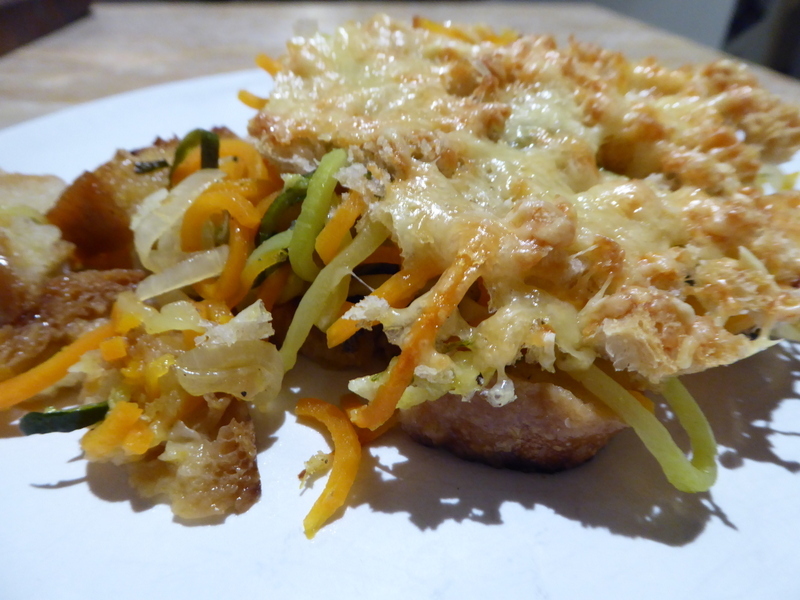 Secondly, as I said many times over the course of the evening – I made dinner for four out of 3 courgettes, 3 carrots and some stale bread – well almost. And so I felt pretty clever and thrifty. And thirdly, this dish is unbelievably good. I was not even cheating myself. The way I might be when I eat tripe…. Although tripe is actually quite good, but thats another story. So anyway, I digress. The thing about this dish is that it’s based on a recipe from an old post of mine for Swiss Chard Panade. And I never really considered what a ‘Panade’ is. So I did a bit of research and came up with…not much. But who cares, it tastes good. And really, thats all that matters. So I may not be a saint anytime soon, but at least I have good intentions and isn’t that what counts? Happy New Year to you all. Pre-heat your oven to 160 C. First prepare your carrots and courgettes and put to one side. Always so pretty. 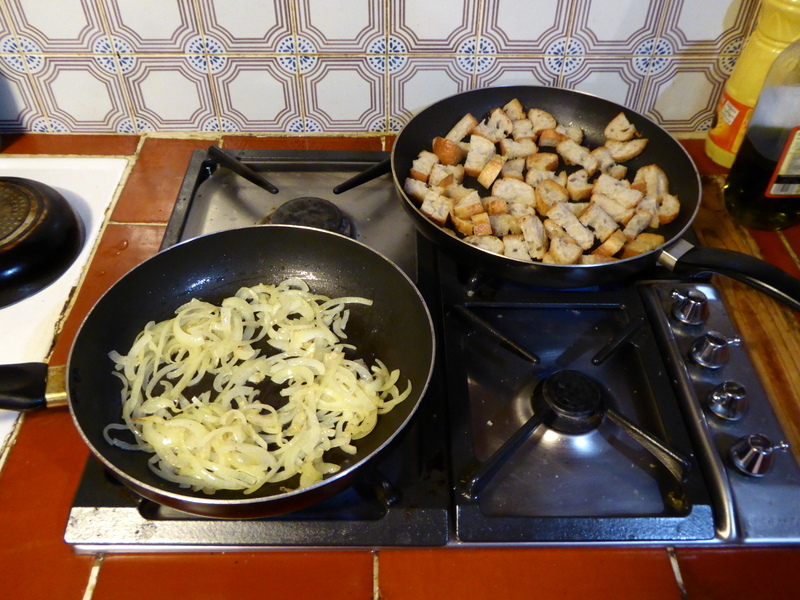 Heat 1 tablespoon of duck fat in a pan and fry your onion for 20 minutes gently until soft. In a separate pan, heat 2 tablespoons of duck fat and fry your bread cubes until golden and crispy. Add your spiralized vegetables to the pan with the onions and cook for 5 minutes. Add the oodles of sliced garlic and cook for another 2 minutes. Then layer your panade. Place the croutons on the bottom of an oven proof dish to cover in one layer. Top with the veggies. Pour over the stock. Sprinkle over breadcrumbs and finally cheese and bake for 45 minutes. Enjoy in a saintly way …. I am popping this recipe into a couple of blogging challenges. Firstly, my old favourite, Credit Crunch Munch hosted by Helen from Fuss Free Flavours and Camilla from Fab Food 4 All. 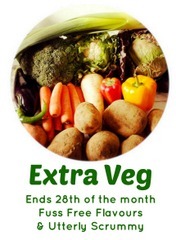 And also Extra Veg hosted by Michelle from Utterly Scrummy Food for Families and Helen from Fuss Free Flavours. 8 Comments on "Incredible Twisted, Meat Free, Leftovers"
Looks delicious Anneli and perfect for tempting into virtuosity. Happy New Year! 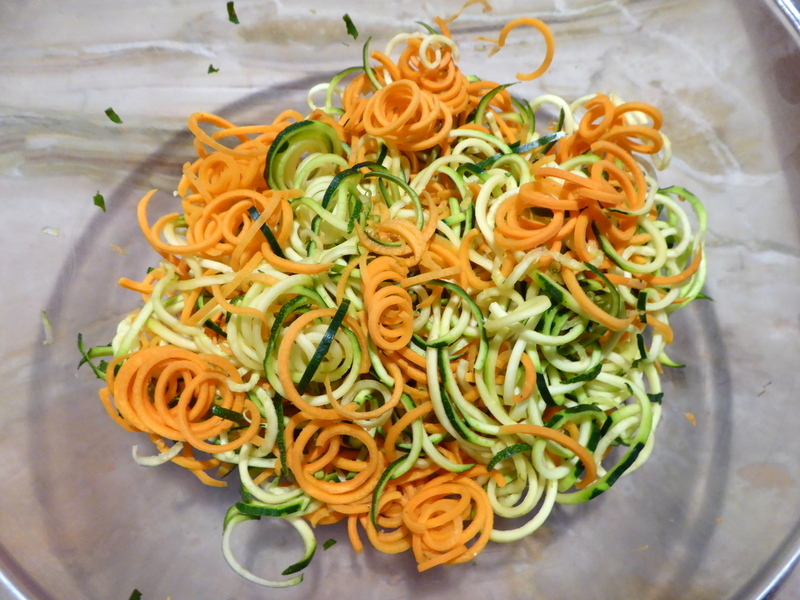 I do love the pretty veg that spiralizer makes. Sainthood might be aiming a little high but this is a good start. Lovely. A dish with duck fat is just my kind of meat free dish.